Saskatoon, Saskatchewan is one of the most uniquely sounding cities in Canada, it is therefore not surprising that it is the home of some exceptional hotels such as Saskatoon Delta Bessborough. We will be staying at the Delta as we wait for our flight to Vegas. 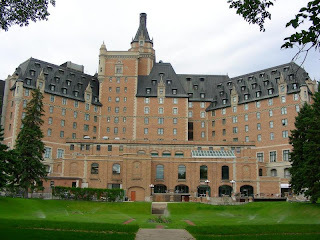 Delta Bessborough is more than a hotel, it is like a castle.In fact it is often referred to as “Castle on the River”. The Delta lounge is decorated in English Jacobean style with solid oak furniture covered in fine rich tapestries. The hotel is situated on 5 acres of Elizabethan gardens with breathtaking views of the South Saskatchewan River. Fine examples of Grotesques, Gargoyles and Heraldic Emblems exist on the exterior of the building. The Delta’s Garden Court cafe-overlooking the river- is known as Saskatoon’s finest Sunday brunch . Despite its historic exterior and public areas, all the rooms feature modern amenities as well as a pool, fitness facility, Damara day spa and a business centre (with 13 meeting rooms) that the modern travel comes to expect. Yet, these modern convinces flow with the hotels classic charm. We are very excited to stay in such a grand establishment that seems like it could be out of a fairy tale.Romantic hotel packages are also available,perfect for upcoming Valentines Day getaways.